King Agrippa comes to Paul and tells him that he is free to speak. Paul gives an autobiographical account of his dealings and explains his side of the story. He asks King Agrippa to hear him “…patiently…” (Acts 26:3) Why is that so important? Because what Paul is about to tell King Agrippa is easy to immediately dismiss without hearing the entire thing. After all, that is what his accusers did! They heard him speak as if he was a messenger of God (which he was), however those who accused him were too quick to judge and thought he spoke blasphemies, comparing himself to God. So it is important that King Agrippa hears Paul with an open heart and mind. Paul begins by stressinh that Moses and the prophets predicted the coming of Chris and that in his name they raised the dead and cast out evil. “At midday, O king, I saw in the way a light from heaven, above the brightness of the sun, shining round about me and them which journeyed with me. And when we were all fallen to the earth, I heard a voice speaking unto me, and saying in the Hebrew tongue, Saul, Saul, [Saul is Paul] why persecutest thou me? it is hard for thee to kick against the pricks. Paul explains to King Agrippa that he was not disobedient unto this heavenly vision. He explains that he first traveled to Damascus, then to Jerusalem and throughout all the coasts of Judea and finally to the Gentiles that they would repent and turn to God, doing works “…meet for repentance.” (Acts 26:20) Paul continues to explain, that for preaching about Jesus, the Jews caught him in the temple, desiring to kill him. Paul dismisses Festus’ claim that he is mad. King Agrippa says he is almost convinced to become a Christian, and comments that Paul would have been set free had he not appealed to Caesar. “I was born in the year of our Lord one thousand eight hundred and five , on the twenty-third day of December, in the town of Sharon, Windsor county, State of Vermont. … My father, Joseph Smith, Sen., left the State of Vermont, and moved to Palmyra, Ontario (now Wayne) county, in the State of New York, when I was in my tenth year, or thereabouts. In about four years after my father’s arrival in Palmyra, he moved with his family into Manchester in the same county of Ontario— His family consisting of eleven souls, namely, my father, Joseph Smith; my mother, Lucy Smith (whose name, previous to her marriage, was Mack, daughter of Solomon Mack); my brothers, Alvin (who died November 19th, 1823, in the 26th year of his age), Hyrum, myself, Samuel Harrison, William, Don Carlos; and my sisters, Sophronia, Catherine, and Lucy. For, notwithstanding the great love which the converts to these different faiths expressed at the time of their conversion, and the great zeal manifested by the respective clergy, who were active in getting up and promoting this extraordinary scene of religious feeling, in order to have everybody converted, as they were pleased to call it, let them join what sect they pleased; yet when the converts began to file off, some to one party and some to another, it was seen that the seemingly good feelings of both the priests and the converts were more pretended than real; for a scene of great confusion and bad feeling ensued—priest contending against priest, and convert against convert; so that all their good feelings one for another, if they ever had any, were entirely lost in a strife of words and a contest about opinions. I was at this time in my fifteenth year. My father’s family was proselyted to the Presbyterian faith, and four of them joined that church, namely, my mother, Lucy; my brothers Hyrum and Samuel Harrison; and my sister Sophronia. During this time of great excitement my mind was called up to serious reflection and great uneasiness; but though my feelings were deep and often poignant, still I kept myself aloof from all these parties, though I attended their several meetings as often as occasion would permit. In process of time my mind became somewhat partial to the Methodist sect, and I felt some desire to be united with them; but so great were the confusion and strife among the different denominations, that it was impossible for a person young as I was, and so unacquainted with men and things, to come to any certain conclusion who was right and who was wrong. My mind at times was greatly excited, the cry and tumult were so great and incessant. The Presbyterians were most decided against the Baptists and Methodists, and used all the powers of both reason and sophistry to prove their errors, or, at least, to make the people think they were in error. On the other hand, the Baptists and Methodists in their turn were equally zealous in endeavoring to establish their own tenets and disprove all others. In the midst of this war of words and tumult of opinions, I often said to myself: What is to be done? Who of all these parties are right; or, are they all wrong together? If any one of them be right, which is it, and how shall I know it? At length I came to the conclusion that I must either remain in darkness and confusion, or else I must do as James directs, that is, ask of God. I at length came to the determination to “ask of God,” concluding that if he gave wisdom to them that lacked wisdom, and would give liberally, and not upbraid, I might venture. So, in accordance with this, my determination to ask of God, I retired to the woods to make the attempt. It was on the morning of a beautiful, clear day, early in the spring of eighteen hundred and twenty . It was the first time in my life that I had made such an attempt, for amidst all my anxieties I had never as yet made the attempt to pray vocally. But, exerting all my powers to call upon God to deliver me out of the power of this enemy which had seized upon me, and at the very moment when I was ready to sink into despair and abandon myself to destruction—not to an imaginary ruin, but to the power of some actual being from the unseen world, who had such marvelous power as I had never before felt in any being—just at this moment of great alarm, I saw a pillar of light exactly over my head, above the brightness of the sun, which descended gradually until it fell upon me.It no sooner appeared than I found myself delivered from the enemy which held me bound. When the light rested upon me I saw two Personages, whose brightness and glory defy all description, standing above me in the air. One of them spake unto me, calling me by name and said, pointing to the other—This is My Beloved Son. Hear Him! 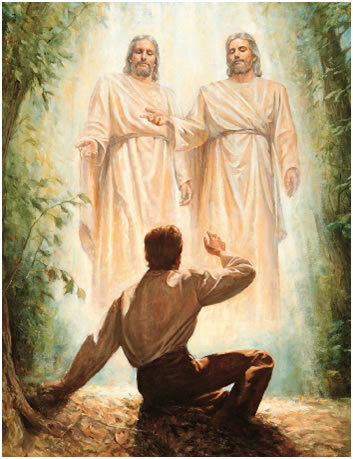 Joseph Smith saw God the Father and His Son Jesus Christ and through him, God himself opened the door the last dispensation, or the “…dispensation of the fullness of times…” (Ephesians 1:10) by calling another Prophet [Joseph Smith], it is important to note that in Mormon Doctrine, Joseph Smith is looked at as a Prophet, like Moses. Some believe that Mormons worship Joseph Smith; however he is not looked at on the same level as Jesus Christ or God. 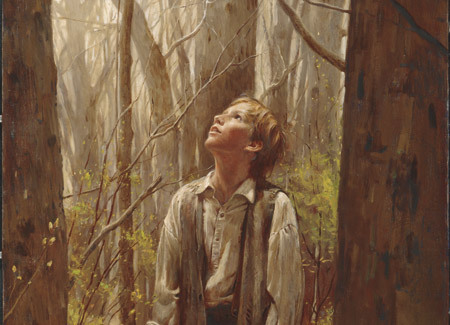 Joseph Smith was an instrument in the hands of God, and nothing more. This entry was posted in Acts, New Testament and tagged Christ, Father, Festus. Testimony, First, First Vision, God, Jesus, Jesus Christ, Joseph, Joseph Smith, King Agrippa, Paul, Saul, Seeing God, Smith, Son, Vision. Bookmark the permalink.